You may not understand it, but there’s an unofficial rule that says you can’t leave Vegas without gorging at one of their famously decadent buffets. Almost all the major luxury hotels on the strip have some sort of all-you-can-eat offer — and each is more lavish than the next. From the Bacchanal Buffet at Caesar’s Palace to the pants-stretching Buffet at Bellagio, expect American-style gluttony on a cosmic level. Nightlife in Vegas has been called the craziest in the world, and if we’re honest — that’s kind of an understatement. This is a party capital that’s so over-the-top/flashy/wild that they came up with a motto like “What Happens in Vegas, Stays in Vegas”. So what makes it incomparable? Maybe it’s because everyone you see is trying to have the best night of their lives — limits be damned. You have NEVER seen such gaudy displays of luxury until you’ve stepped foot inside any of the big-name hotel’s on the Vegas strip. This is place where money is literally no object, so hotel’s make sure to accommodate every fantasy. At some point every tourist should pass through the grand Bellagio on their way to watch the famous fountain show, but there are so many other themed hotels to admire. From the pyramid-style Luxor to The Venetian which has its own water canals, it’s not unusual to spend your evenings walking in and out of the city’s most outlandish lobbies. One of the best things about visiting Vegas is being able to take a road trip to nearby attractions like Los Angeles, San Fran and — for the adventurous types — the Grand Canyon. To give you some perspective, the drive from Vegas to Southern California is just over four hours, but you’ll want to time your trip correctly to avoid nightmarish traffic. Seriously, have ever been stuck in a traffic jam in the middle of nowhere? 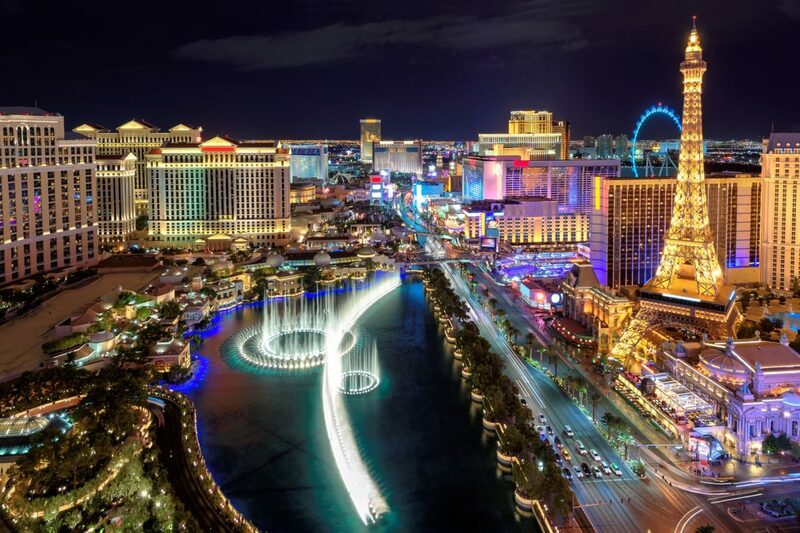 Bright lights, big city… the Las Vegas strip might as well be another planet. There’s loads of FREE entertaining activities across the strip — and it almost feels like one giant stage. First up you’ll want to take a snap with the iconic “Welcome to Fabulous Las Vegas, Nevada” sign. There’s also the iconic Fountains of Bellagio and Fall of Atlantis show, a free animatronic spectacle inside the Forum Shops at Caesars Palace. For a nature escape, there’s the Wildlife Habitat at Flamingo Las Vegas, a zoo-style attraction, and for killer city views, head to the High Roller — it’s the tallest observation wheel in the world. What to expect: What’s Las Vegas without its headlining stars?! While it’s true that Vegas is the heartland of formerly famous performers (erm, Backstreet Boys), the city still pulls in the big guns. Céline Dion, Lady Gaga, Mariah Carey, Cher… even Britney has a Las Vegas residency in 2019!